John Putnam: [off-screen] This is Sand Rock, Arizona, of a late evening in early spring. It's a nice town, knowing its past and sure of its future, as it makes ready for the night, and the predictable morning. The desert blankets the earth, cooling, resting for the fight with tomorrow's sun. And in my house near the town, we're also sure of the future. So very sure. 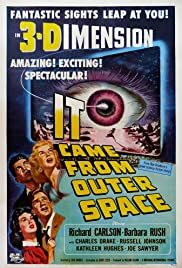 Q: Is 'It Came from Outer Space' based on a book? 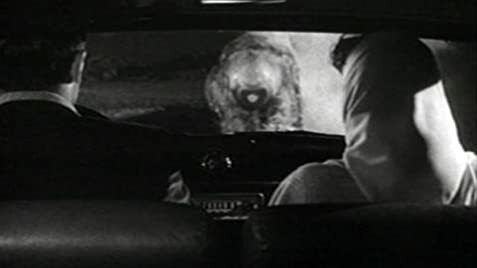 Q: Any recommendations for other movies from the 1950s that feature creatures from outer space? Q: What is the movie about? This is director Jack Arnold's first science-fiction effort and one of the earliest to use a desert setting. Richard Carlson is very believable as an astronomer who, along with his fiancee, witnesses a meteor crash-landing that turns out to be a spacecraft. No one in the small town believes him until they start disappearing. Arnold uses theremin music to great effect, the photography is eerie, dialog (by Ray Bradbury) poetic, and the alien a terrifying large crawling mass with one bulging eye that leaves a snail-like trail in its path. The aliens are not bent on destruction - an interesting precursor to Steven Spielberg's expensive "Close Encounters of the Third Kind" (1977)- even its main titles are at the End. This is low-key, intelligent, satisfying drama. Co-starring are Barbara Rush (she's a babe), Russell Johnson (likewise), Charles Drake, Joe Sawyer, Kathleen Hughes (who's tantalizing in a cameo). 50 of 55 people found this review helpful. Was this review helpful to you?